A large part of a tree fell on a house on Euclid Avenue, just west of the Arlington Heights Memorial Library. Arlington Heights firefighter/paramedics responded to a mulch fire twice in the 200 block of West St. James Tuesday. Both fires were very small. Firefighters responded a few blocks north in the 100-200 block of West Euclid Avenue to check for structural damage to a house that was hit by a large part of a tree that fell in high winds. The homeowner had been trying to get the neighbor to the west to remove the branch, which had been creaking recently. 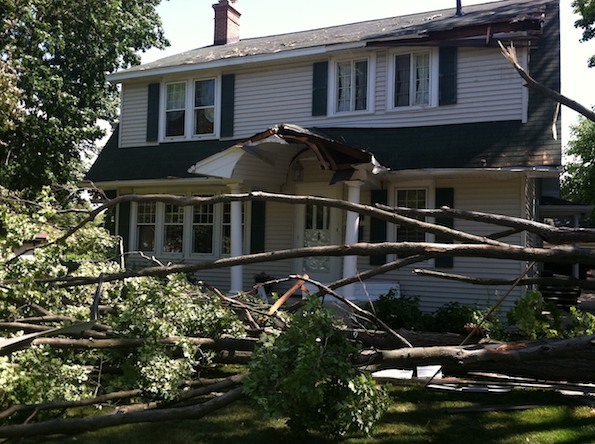 The falling tree damaged a front porch roof and the corner of the second floor roof. A part of the tree also damaged the electric meter. Schaumburg had power lines down near Meacham Road and Thoreau that was affecting traffic signals. Schaumburg firefighters also responded to a grass fire near Schaumburg Road and Barrington Road. Bloomingdale and Glenside Fire Protection District firefighters also fought at an extra alarm fire at a house in the 1800 block of Timberlane Trail. A fire that was fueled by a gas line was also fanned by high winds. Winds ranged from about 16 mph to 27 mph and gusted from about 26 mph to 36 mph, Tuesday afternoon. A RED FLAG WARNING was issued from 1:00 p.m. until 8 p.m. Tuesday. VIDEO: Monday firefighters extinguished an apparent mulch fire that ignited a fence, bushes and/or small trees behind Mariano’s Fresh Market.